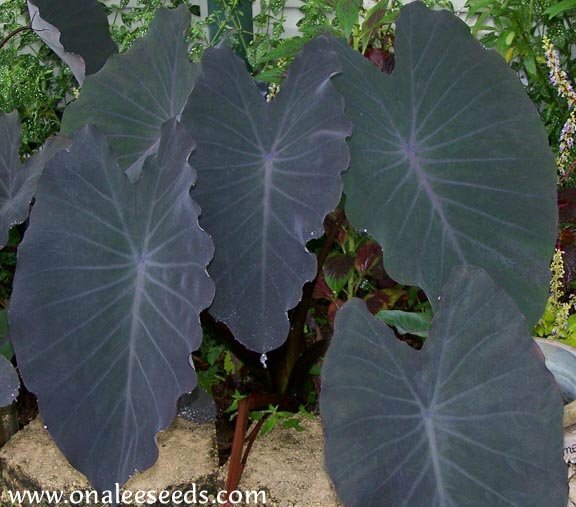 Elephant Ear: BLACK RUNNER (Black Ruffles, Like Black Magic) Plant is HERE! I have mine planted in average, sandy soil and they are doing great with regular, average watering. The leaves on these start out green with deep purple/black veins. In the sun, this turns to a deep purple/black over the entire leaf in deep shade, it will stay more green with black veins - it needs some sun to really bring out its full potential. These plants are hardy in zones 8 and warmer bulbs may be lifted in the winter in colder zones and over wintered in containers indoors. 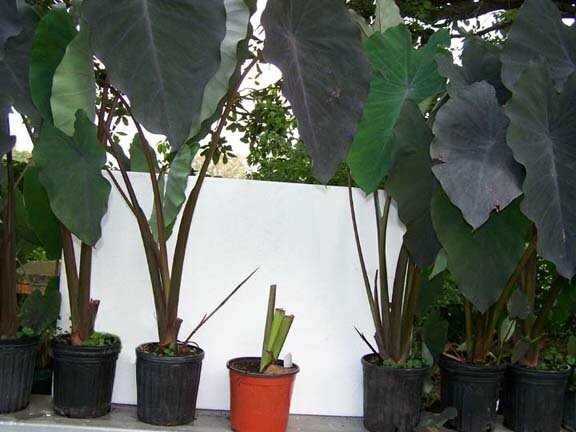 You are buying 1 EXTRA LARGE 'Black Runner" Elephant Ear. The plant is currently from 18 - 22 high BUT THE LEAVES/STEMS WILL BE CUT BACK to leave only the shortest leaf or possibly NO LEAVES, BEFORE SHIPPING. I have found that this is the LEAST STRESSFUL way to ship these large plants. 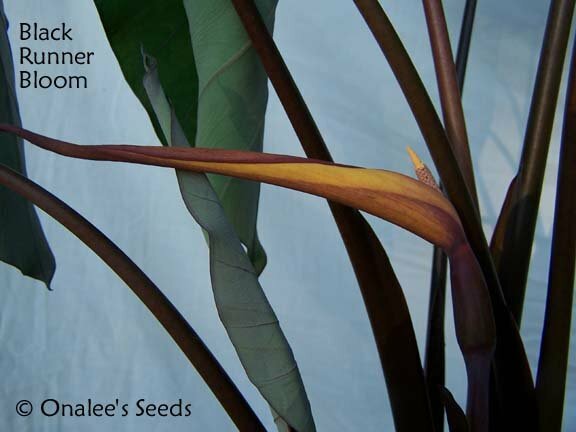 They will recover quickly and begin growing new leaves within a week to 10 days after they are established in their new home and will regain their height and vigor within a few weeks if planted according to instructions. Many of these plants have already started to send out runners and, if possible, I will leave the runners on the plants for shipping. I just wanted to thank you again for the black EE's. They arrived on Friday, I stuck them in a bucket of water and finally had a few minutes to stick them in pots of dirt Sunday evening. Now, there was no sign of any leaves coming out when I planted them--but Monday morning I had 3 new leaves, one of them fully open. I could not believe it! Even my neighbor was shocked that this happened overnight. I now have a total of 12 leaves on the 5 plants with more to open. I am totally thrilled with the black elephant ears! Just had to tell you. Thanks again!